An unforgettable story of the Civil War, from the Director of Gettysburg. Based on Jeffrey M. Shaara's bestseller, God's and Generals recounts the fierce allegiances and combat of the early Civil War. Ronald F. Maxwell directs this epic prequel to his Gettysburg, framing the story with three bold men and three fateful battles. The men: Joshua Chamberlain (Jeff Daniels), "Stonewall" Jackson (Stephen Lang), Robert E. Lee (Robert Duvall). The battles: Manassas, Fredericksburg, Chancellorsville. Through these combatants and conflicts we witness the bravery and strife of a nation at war with itself. $4.675 million on 1533 screens. Gods and Generals is a rather lengthy, but deserved adaptation of Jeffrey Shaara’s Pulitzer Prize-winning novel, “The Killer Angels”, and a prequel to the equally epic-in-length film, Gettysburg, from 1993. Helmed by director/writer/producer Ronald Maxwell and funded heavily by Ted Turner, Gods and Generals deals with more than just one singular battle - as in Gettysburg - and covers three military campaigns in the war between the states; the first battle of Manassas (Bull Run), as well as the battles of Fredericksburg and Chancellorsville. Turner, Maxwell, and company loaded up the film with a fairly impressive, albeit mostly B-list actors as Robert Duvall checks in with the most impressive job of the bunch as General Robert E. Lee. Other performances of note include Jeff Daniels as Colonel Joshua Chamberlain, Stephen Lang as General “Stonewall” Jackson, and Bruce Boxleitner as General James Longstreet. Mira Sorvino has a small part playing Fanny Chamberlain and she definitely makes good use of her short screen time. While some of Maxwell’s dialogue was admittedly detached and difficult to deliver for the actors, considering the historical nature of the film, it was a forgivable offense and most pulled off their parts quite well. Let us not forget that over 600,000 Americans died during the Civil War – more deaths than the other conflicts in our nation’s history combined. It was a very tumultuous time in our nation’s history and definitely something that should serve as a sobering reminder while our young men and women in the military are off right now fighting for a just and honorable cause – the end of terrorism as we know it. However, like we see in Gods and Generals, war is always costly in human terms and even with the advancements in technology and warfare from the 19th century up until now, it’s still a horrific experience for all involved. For those with even a passing interest in American history, Gods and Generals is a great way to revisit the events that happened just before Gettysburg. It’s a well executed film and while it’s admittedly laborious in spots, it comes highly recommended. For those of you with no interest in American history and see no need to learn about the events that shaped this great nation, I only have three words for you - shame on you. 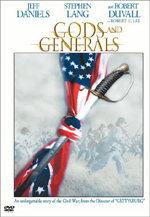 Gods and Generals comes as a double-sided DVD-18 that contains portions of the flim on both sides of the disc. Warner brings the film to DVD in an anamorphically enhanced widescreen transfer in the film’s theatrical aspect ratio of 2.35:1. The film was tightly and finely detailed - as a recent big budget film should be – and Gods and Generals was a strikingly gorgeous film. Colors in the film, while natural, looked quite vibrant as the blue and gray hues in the uniforms were properly saturated and natural looking, while the wooded backdrops of the battlefields looked very lush and vibrant. Bleeding or smearing weren’t an issue and black levels were consistently strong and deep, with excellent shadow detail and delineation at all times. Even with all of the fog and smoke that descended upon the battlefields, the image never broke up or lost any of its impressive depth. Detail was very impressive, as individual hairs on the character’s heads (and thick beards) could be easily seen and the intricate detail in buttons, medals, and sidearms was also noteworthy. Flaws were few and far between as I noted some slight grain and a bit of edge enhancement. The master print was in pristine shape and relatively free of blemishes and when it was all said and done, Gods and Generals was free of most flaws that plague many discs on the market today. Gods and Generals was a great looking film and Warner continues to consistently pump out some really great looking transfers. Excellent job. Warner has only given viewers one listening option to choose from, as their impressive Dolby Digital 5.1 mix is the only one offered on the Gods and Generals DVD. The track was quite an impressive one and it kept your surrounds fairly active for almost four hours of running time. During the intense battle sequences on display in the film, you’ll literally feel like Civil War is going on around you, as explosions rumble and bullets fly with a realistic intensity that was quite imposing. However, not only does the transfer contain a lot of big, booming effects to give your surrounds a workout, but it also contains plenty of quiet, ambient moments that fill your listening space with simple, yet notable, environmental envelopment that warmly and peacefully shrouds the soundstage with very subtle, yet distinct, effects. Dialogue was crystal clear and crisp and reproduced nicely in the front surrounds without any instances or harshness or edginess at any time. The film’s epic score from John Frizzell and Randy Edelman received excellent dynamics and fidelity from the folks at Warner and along with some excellent extension, the track contained crisp highs and taut lows throughout. LFE usage was quite bombastic and resonating at many points during the film and really added to the aural experience that is Gods and Generals. Definitely a very pleasing outing from the fine folks at Warner. Warner has also included subtitles in English, French and Spanish, along with English Closed Captions if you need ‘em. Extras on the disc are spread out over both sides of the platter and for simplicity’s sake, I’ll start with Side A first. 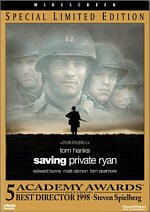 The film’s Audio Commentary comes with a disclaimer – “This commentary is presented in sections. After each portion, we’ll take you to the next section, until you reach the end of the movie.” The commentary is hosted by director/writer/producer Ron Maxwell and his two co-hosts, Keith Gibson (the director of operations for the VMI Museum) and James I. Robertson (a distinguished alumni professor for Virginia Tech). Via branching, you are taken to the scenes that contain commentary and out of the almost four hours of running time, a bit less than half of that contains accompanying commentary. The subject matter is more history than film production and while we do get some filmmaking tidbits and behind-the-scenes anecdotes, the historical background information is much more informative in my opinion. This was an active commentary and contained some really great information on the film, as well as the war, and history buffs and Civil War buffs alike will really enjoy. While it’s a huge time investment just to watch the film itself, you really should find the time to check out the commentary as well. Other features include a 3-minute Introduction by Ted Turner where he discusses how Civil War history has always been a part of is life and how honored he was to be able to commission a film like Gods and Generals. We also find a couple of Music Videos - one for Bob Dylan’s “Cross the Green Mountain” and one for Mary Fahl’s “Going Home”. Finishing off Side A is the film’s Theatrical Trailer. Obviously, the Audio Commentary from Side A continues on the flip side of the disc and along with it, come some other really nice supplements as well. Starting things off is Journey to the Past (22:00) and this featurette, hosted by director Ron Maxwell and actress Donzaleigh Abernathy, takes us through the production of the film, as well as some decent backstory/history on what was taking place in the country when the real life Gods and Generals was playing out. 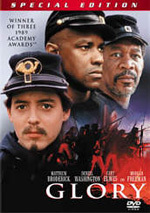 This isn’t really as much a behind-the-scenes look at the film as much as it is a brief history lesson on the events the film covers, as well as how the actors prepared for their parts in the film by learning more about their characters historically and the pivotal role they played during this dark time in our nation’s past. It’s a really great discussion on the war, as well as the film, and Maxwell and Abernathy are able to make this a very interesting, educational, and engaging supplement. The Authenticities of the Film (12:55) follows and gives us a great look behind-the-scenes, as we learn a great deal about the authentic look-and-feel of the film. We learn how towns were constructed or existing towns were “modified” to double as 19th century America, how the chaotic battles we filmed, how real life Civil War re-enactors and extras were used, and in general, how everyone pulled together to make Gods and Generals the epic film that it is. There’s some good stuff covered here and if I have one complaint, it’s that the extra isn’t long or in-depth enough. The last supplement is entitled The Life of Thomas “Stonewall” Jackson (14:29) and here, via clips from the film and countless snippets and comments from authors, biographers, and historians, we learn a good bit about the life of “Stonewall” Jackson and what drove him to become one of the greatest military minds of all time. I won’t go into a mini history lesson here, but trust me when I say that this supplement is worthy of the short time investment it’ll take to watch it. For further study, there are dozens of wonderful books on Jackson that will obviously go into much greater detail. Visit Virginia is a quick 30-second snippet from the tourism board of the state and in its short running time, it concentrates on historical heritage of the state. 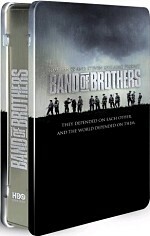 Warner has also included some really nice DVD-ROM materials for those of you who enjoy that type of supplement and included you’ll find some weblinks to the film’s theatrical website, a historical timeline of events, a quiz that will test your knowledge of the Civil War, and some other, more interactive materials. Not being a big fan of such extras, I pretty much glossed over them, but they’re there if you want to check ‘em out. Finally! Something Ted Turner has done that I actually agree with! Gods and Generals is a painfully authentic film that goes to great lengths to present both sides of the story in a historically accurate and authentic manner. Critics and viewers alike have slammed the film for its overtly religious tone or seemingly pro-Southern slant (which I never saw), but anyone who knows anything about American history and those who fought in the Civil War know this element of the story to be true and my hat’s off to everyone involved in the production for bringing this aspect of the story to light. The Civil War was more than just white hats versus black hats and thankfully, Gods and Generals isn’t afraid to show that. Warner has brought fans of the film a meticulously crafted DVD that contains some well done extras, as well as excellent audio and video transfers for the film. This is a must-have for anyone interested in American history the way it really happened … and Civil War buffs would simply be remiss if they didn’t add this to their collection right away. Quite simply, Gods and Generals comes very highly recommended.